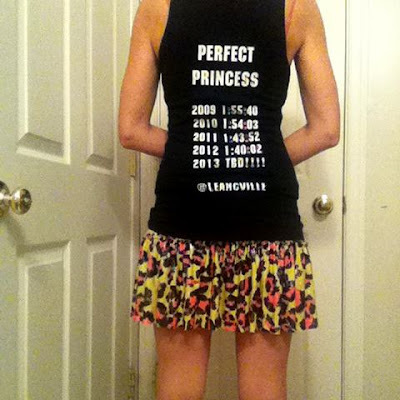 Perfect Princess T-shirt with @runTeamSparkle Skirt! The faster 1/2 will be a Perfect Princess on Feb 24! @LeahCville has run progressively faster each year! Will you run Disney's Princess Half Marathon? Will you be a runDisney Perfect Princess, too? Well, I'll be there for the second year in a row. I'm afraid with my weak right knee the days of improving my times are behind me. But I ran it in 2:24 last year and I have run faster halfs even with my bad knee. So who knows? I might be last year's time. I'll look for you and the shirts and say "hi".